Pleomorphic adenoma (PA) accounts for 70-80% of all neoplasms of salivary glands and involves parotid gland in approximately 80% of cases. It occurs in 3rd to 6th decades of life with a slight female predominance. Almost 75% of the parotid tumors involve the superficial lobe and present with a painless, slow growing mass in front of or behind the ear. The remaining 25% involve the deep lobe of the parotid and present as a parapharyngeal mass. Facial nerve involvement should raise suspicion for malignant transformation. 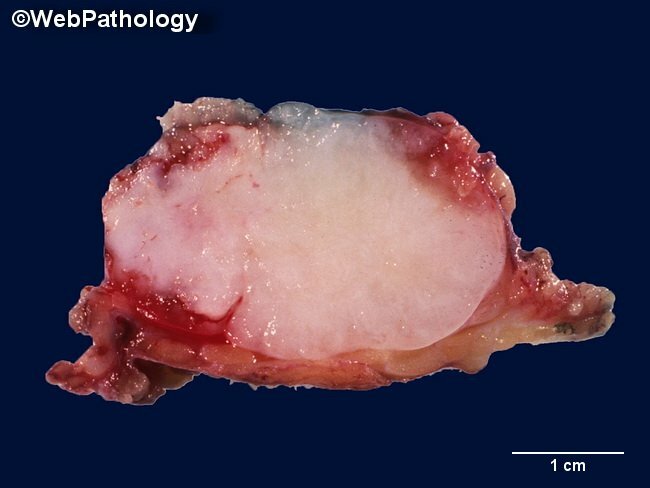 This image shows the characteristic gross appearance of pleomorphic adenoma with pink-tan rubbery surface, well-defined pushing margins and translucent areas of cartilaginous differentiation surrounded by a thin rim of unremarkable salivary gland. The patient was a 47 y/o male who presented with a slowly-enlarging right neck mass. Fine needle aspiration biopsy was consistent with a pleomorphic adenoma. The diagnosis was confirmed in the superficial parotidectomy specimen.